In the Outback of Australia, from the cities to the seaside, on business or towing your caravan on a country road with the kids, the 190 Caravan and Holiday Parks linked in the Top Tourist Parks of Australia chain put your happiness first. It is all about value choices and we give you plenty. Kick back in a luxurious cabin, or take a tent site close to all the mod cons. Join the rush into caravanning. Be part of the RV (Recreational Vehicle) adventure. Put the caravan on a shady powered site or move in with a campervan or motorhome. 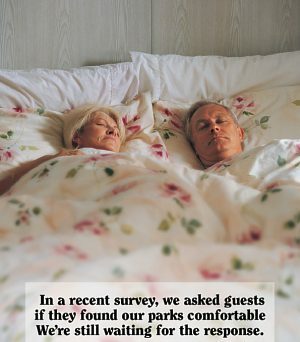 Top Tourist Parks want you to be at home and our parks will go the extra lap and back to make that happen. That is why Top Tourist Parks of Australia bites the bullet on the classification of cabin accommodation in our parks throughout Australia. We bring the various types of cabins together into four classifications to assist the traveller. We want you to know what to expect when you book a cabin within a particular category. So now we offer Superior, Deluxe, Standard ensuite and Standard non-ensuite cabins. You have the choices and the range to make a decision which brings the one thing which matters most to us – your happiness. Accreditation also has Top Tourist’s complete support. Our member parks are proud to display and stand behind the benefits the yellow tick on the green background guarantees our guests. The Accreditation tick shows that they meet the requirements of the National Accreditation Program. Care for the environment through sustainable environmental management practices. Operate under a Code of Conduct. And; to make it easy to understand what is being offered there is also an explanation of services symbols in our Top Tourist Parks Directory. The Icons include Linen Hire, Other Accommodation, Travel Insurance, Shop/Kiosk, Motor homes, Van storage, Sewer Dump Point, Email and Arid Zone. There is no mystery about Top Tourist Parks of Australia our member caravan and holiday parks offer value choices.